In 1791 the Earl Of Eglinton formed a company to build a canal from Glasgow to Ardrossan. Almost 20 years later, in 1810 the section between Paisley and Johnstone was completed and was duly opened on the 6th November that year with the launch of The Countess of Eglinton. However, only 4 days later, on Saturday, 10th November 1810, disaster struck on Martinmas Fair Day holiday. That fateful day being a holiday, a large number of families decided to take a trip on the newly opened canal. As the Countess of Eglinton barge returned from Johnstone to the Paisley canal basin with a full complement of passengers, large numbers attempted to board before the passengers from Johnstone had a chance to disembark. This led the boat to become top-heavy and it capsized, throwing the passengers into the water. In those days very few people could swim, and along with their heavy winter clothes and the cold of November many quickly succumbed to the conditions and drowned. Others struggled to get out of the water due to the steep smooth sides of the canal. In all 85 men woman and children died that day, many of them related, as it was a family day out. The Countess of Eglinton continued to transport passengers along the canal for many years after without mishap. Eventually with the rise of the railway the canal was forced to close in 1881 and the canal was filled in and became the Canal Street Railway Line, running from Glasgow to Addrossan. However, in the early eighties this line was closed but re-opened later as the Glasgow to Canal Street line which stops just short of the original Canal Basin. 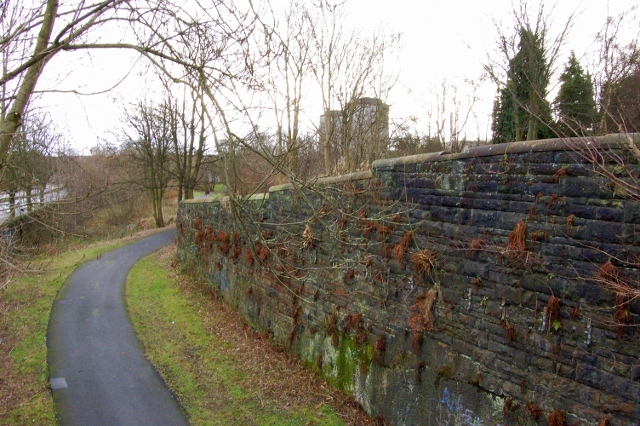 Much of the route of the canal can still be seen today although most of it is now a cycle path. The section seen, right, runs along Canal Street bordering Castlehead Church. 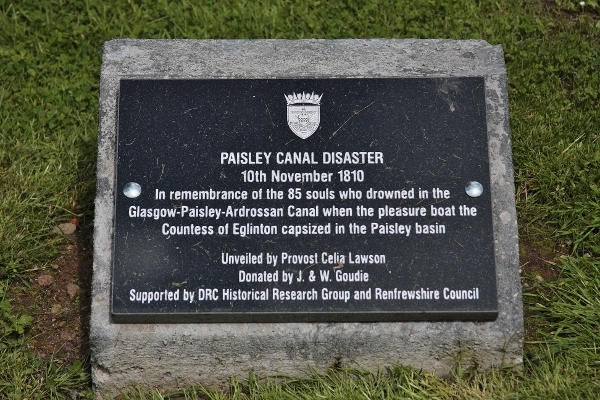 Two hundred years after the disaster a Plaque was unveiled by the then Provost of Paisley, Celia Lawson, to commemorate the 85 who drowned in the Canal. 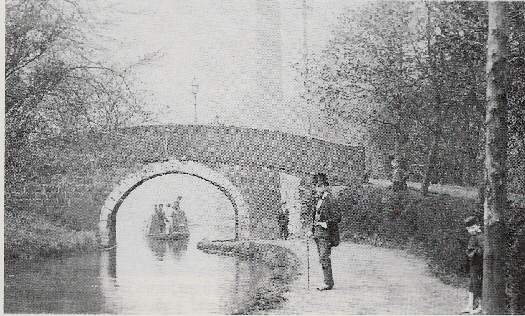 The Paisley Canal Disaster was not the first death associated with the canal. On 17th May 1810, whilst the canal was still under construction, and just 6 months before the canal was opened, Paisley poet Robert Tannahill drowned in a culvert between the canal and the Candren Burn. In a fit of depression after a book of poems was turned down by publishers, Tannahill threw himself into a culvert on the Candren Burn. 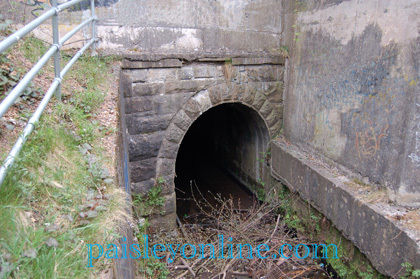 His body was pulled from this culvert which linked with the Canal. Tannahill was buried in the West Relief Churchyard - now Castlehead Church, and within yards of the Canal where he met his untimely death.